Thanks to Alfie, Snoopy, Luna and My Brown Newfies for bringing us the Monday Mischief Pet Blog Hop. 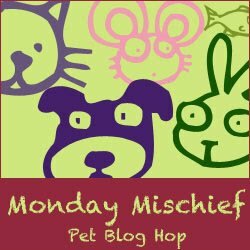 Make sure you hop on through to the other blogs to see what trouble our various critters have gotten into over the weekend. Think? That's a new command to me - I think my humans know they'd be in too much trouble if they ever asked me to think *waggy tail* Bella looks like my kind of girl though - top marks for mischief! Welcome back! I hope you enjoyed your holiday! Bella is one smart cookie!! LOL! What do you mean think? There's to time to think! LOL! Bella and Leroy would make a great pair! BOL!! I love the look on her face when she looked at the camera!! This video reminded me of the mom I heard cautioning her son to "use good judgement" as he rushed off to play in an old building. Tee Hee - that look tells me Bella knows exactly what 'think' means!! WEll, after all, you did ask her to "Think" Don't ya love it when they get smarter than you. Hi Higgins! Thanks for stopping by. See what you started here, Snoopy? Now all the dogs are getting good at making mischief - I swear she read your rules! Hahahaha!!!! I love that dog. She knew getting a leg up was the answer!!! !